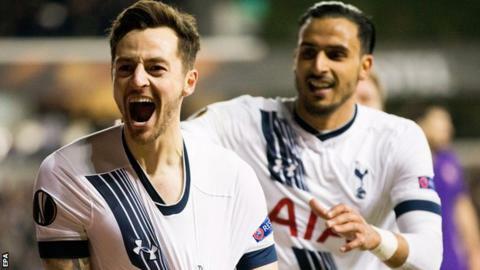 Tottenham dispatched Fiorentina to reach the Europa League last 16 and underline their credentials as serious contenders for the tournament. Hosts Spurs took the lead as Ryan Mason strode through and side-footed home midway through the first half. The Italians rallied briefly after the break, but Erik Lamela snuffed out any hope of a fightback as he smashed in from close range. An own goal from skipper Gonzalo Rodriguez completed the Viola's misery. Tottenham's Harry Kane is expected to return to the Tottenham line-up for Sunday's Premier League match against Swansea after breaking his nose in the FA Cup defeat by Crystal Palace last weekend. But the England forward's absence gave an insight into how Spurs, who lack a clear striking alternative, might cope without their top-scorer. Dele Alli, Christian Eriksen and Lamela took it in turns to form the focal point of the attack and Fiorentina's defence struggled to keep up with a constant carousel of changing positions and personnel. Alli nipped ahead of Davide Astori to play in Mason for the first goal before the sheer weight of Tottenham numbers in the visitors' box paid off as Lamela blasted home on the rebound from Nacer Chadli's effort. Two points off the top of the Premier League, securing Champions League qualification with a top-four finish is fast becoming the minimum Spurs fans expect from their domestic campaign. However, with their season reduced to two fronts by the weekend's home loss to Palace, Tottenham may well fancy their chances of securing their first European silverware since 1984's Uefa Cup win and a direct ticket to next season's Champions League. With no seeding or separation of teams from the same country in the last 16, Spurs could be drawn against Liverpool, Manchester United or the likes of Spain's Valencia, Borussia Dortmund of Germany or Ukranian side Shakhtar Donetsk in the next round. They need not fear any of them though after an enterprising performance undid a Fiorentina side just six points off the top of Serie A.
Whoever the opposition, Tottenham will be without Alli for the first leg of the next round. The 19-year-old, who was warned about his conduct by boss Mauricio Pochettino after apparently aiming a kick at a Fiorentina player in the first leg, picked up a harsh booking for diving late on. It did not deter the White Hart Lane crowd from giving the England midfielder a standing ovation when he was replaced after another mature and influential display. Spurs boss Mauricio Pochettino: "I'm very pleased, we showed character and played very well against a team that play very well. "We fully deserve the result, I'm very pleased with the performance. "Now we need to recover because the competition never stops and we need to be ready for the next game against Swansea on Sunday. "I think we have a big motivation in the Premier League and now we have two competitions. We are in a good position in the table, I think the motivation is fantastic." Tottenham host Swansea in the Premier League on Sunday before London derbies away to West Ham and at home to Arsenal. Match ends, Tottenham Hotspur 3, Fiorentina 0. Second Half ends, Tottenham Hotspur 3, Fiorentina 0. Attempt missed. Mauro Zárate (Fiorentina) right footed shot from outside the box misses to the left. Assisted by Marcos Alonso. Corner, Tottenham Hotspur. Conceded by Davide Astori. Attempt saved. Christian Eriksen (Tottenham Hotspur) left footed shot from the centre of the box is saved in the bottom left corner. Assisted by Ben Davies with a cross. Matias Vecino (Fiorentina) wins a free kick in the defensive half. Substitution, Tottenham Hotspur. Harry Winks replaces Ryan Mason. Corner, Tottenham Hotspur. Conceded by Ciprian Tatarusanu. Attempt saved. Ryan Mason (Tottenham Hotspur) right footed shot from outside the box is saved in the top centre of the goal. Assisted by Nacer Chadli. Nenad Tomovic (Fiorentina) wins a free kick on the right wing. Foul by Josh Onomah (Tottenham Hotspur). Substitution, Tottenham Hotspur. Nabil Bentaleb replaces Dele Alli. Toby Alderweireld (Tottenham Hotspur) wins a free kick in the defensive half. Attempt blocked. Mauro Zárate (Fiorentina) left footed shot from outside the box is blocked. Assisted by Nikola Kalinic. Substitution, Fiorentina. Matías Fernández replaces Milan Badelj. Own Goal by Gonzalo Rodríguez, Fiorentina. Tottenham Hotspur 3, Fiorentina 0. Attempt missed. Ryan Mason (Tottenham Hotspur) right footed shot from outside the box is high and wide to the right. Assisted by Dele Alli. Substitution, Fiorentina. Jakub Blaszczykowski replaces Borja Valero. Corner, Fiorentina. Conceded by Ben Davies. Attempt missed. Mauro Zárate (Fiorentina) left footed shot from the centre of the box misses to the right. Assisted by Borja Valero. Nikola Kalinic (Fiorentina) wins a free kick in the defensive half. Corner, Tottenham Hotspur. Conceded by Nenad Tomovic. Corner, Fiorentina. Conceded by Toby Alderweireld. Foul by Kevin Wimmer (Tottenham Hotspur).